All*Star Saturday and The Big Throw. The biggest of Big Ups go out to Jan, Michael, and Greg–the creative forces behind The Invisible String, and The Big Throw! These gentlemen have done us all a tremendous service by documenting the various iterations flying disc sports/artistry that live under the phrase playing Frisbee. To have them join us again at our Green Beach, and scheduling The Big Throw event to coincide with the Great Gaddoz All*Star Thursday was an honor. The Hard Corps of the Big Apple remains grateful that we were able to play host. Your intrepid reporter recently started a new gig as Director of Development for the CityKids Foundation www.citykids.com, and I had a to make a presentation to the Board on Saturday. ARRRRRGH! The folks on our Board are good people, and it went well, but I gotta tell you that I was twitchinâ€™ the moment I was finished. I arrived at 3:23pm having missed the Big Throw (see the image on the FB version of the A*TC), but there was yet another huge turnout including: Takashi, the Urban Street Styler; Kenji; Richie Regs; Bradford T.; Mojito Man Jay; Roger and Tricia; TedShred; Young JAMes; Young Daniel; Bill W.; Rob; Cavassa Heaver; Forever Trevor; JB; The Great Gaddoz; Fearless Lou; Pat and Miracle Max; Chuck; Sue Strait; Erin Hart (in from Cali with her sister Megan); The Oracle; Alan C.; Greg Catch; Michael; Jan; Buti; and Jim Heaver. As always the Jams were GREAT! I got a nice one in with Bill, TedShred, Young JAMes (who hit a modified China Syndrome!) and Buti. There were a bunch of other wonderful combinations of Jammers that honestly, I just can’t recall. That includes my own Jams, and I kept at it until the darkness fell. The funniest moment came as we were packing up to head to Malachy’s. The Oracle picked up a certain special statue and said â€œI have brought out The Gamboa today because, well, I forgot it on Thursday. After consulting with a committee of between 2 and 69, Oracle presented The Gamboa to drum roll, please.wait for itYoung JAMes. Both he and Young Daniel have really helped to revitalize the Tribe, but he really earned it with his play on Saturday. It was an incredible day. You have done a wonderful capturation of the insanehein that was last weekend, but here is some stuff you were not able to witness on Sunday. Teddy Ballgame, [Young] JAMes, and I jammed for 2 hours, meeting at 12noon sharp before anyone showed. * [We were] doing weaves, speed flow and quick catches for 20 minutes before we even delayed it. Then it really got kind of crazy with an intermittently nice beach-like wind and no humidity. I did my second Gitis, clapped my hands together and my nail loosened, so I took a break for 20 minutes. James and Ted got even crazier for awhile–man can they run and get after it! [Young] JAMes took a break, and I re-upped with Ted. Among many of the amazing things he did was a spinning Scarecrow brush to Gitis. * – [The Tribe was] seeing the Brooklyn Bridge and eating Dim Sum in Chinatown. At 2 -2:30pm JH (The Oracle) showed with Matteo, Fearless, Brad, Erin, Megan, and The Invisible String crew. The jamming continued while JH was interviewed by the Jan, Michael, and Greg. Then we stopped and watched the interview which is a must see in the movie to be. Heather and Rob showed, we did some group pics and I had to leave at 4:15pm. What an innnnnncredible time! And I am sure the hein jams continued you’ll have to ask who was there and what happened. til next time. An addition from Robbie-Rob You forgot to mention the pre-A*T bike ride with Gaddoz, The Meiers, Heather, and myself…through Times Square and then mini Jam in Washington Square Park and up the Hudson River. Separately – I’d like to share a little bit about from the depths of my (very open) heart. 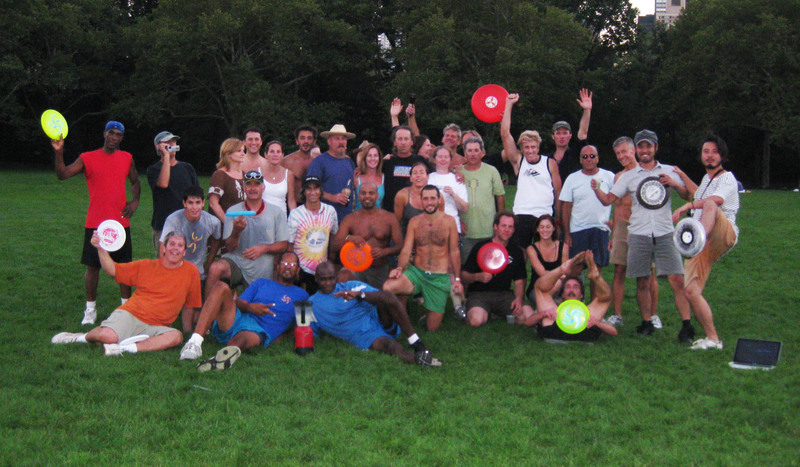 All*Star Thursdays started in 2004 as an inside joke among a small group of friends http://www.freestyle-frisbee.com/features/all_star_thursdays.html. I started writing the A*T Chronicles in ’05 because we were having so much fun that I needed to share it with other Jammers. Folks like Gary A. Tommy L., J-Will, Toddy B., and Alan C. and others began turning up. When Sir Schillz came for one in May 2006, things started to morph. It changed it grew and Everybody Knew. Bill Wright was our first All*Star Thursday Guest Jammer Initiative honoree. There were Skippy Jammer, Fabiosis, and the All*Schillz Thursday featuring Dave, Amy, and Brady; among other A*TGJI designees. Dave Murphy came in for the longest Jam-day of that year; Paul Kenney turned up; Jan-Twirler became the first non-Noo Yawkuh to don the Yella Jersey; Phillip the Sleepy Jammer; (Ciao) Zanardi; Laerbs; Randy Silvey; Claudio and Clay; Mikey Reid; Jake Gauthier; Dan Yarnell; Pat Carrasco; Arthur C. keeps sneaking in and so many of our brethren and sistren who have come in to get some o’ dat New York Juju and Spread the Jam. And of course there was the was the legendary Chipper-Bro/Bud Light Team reunification A*T where Crazy John, Krae Van Sickle, Laerbs, Bill W. and a slew of wonderful friends turned up for our shredfest. And SO MANY MORE not listed here! It’s really all about the shared joy of Frisbee Flight and The Tribe. So thanks to TedShred and the Lovely Chrissy for getting this whole thing started–not to mention the Margaritas. 🙂 Thanks to Sir Roger and the Lady Tricia, proprietors of Chez Meier’ the Official Hosts of most of our Guest Jammers and every significant party we have ever had. Thanks to Robbie-Rob for his reports on the state of Euro-Jamming. Thanks to Fearless Lou for his OCD All-Natural Nails. Thanks to the Ageless Trevor Brown for the inspiration to play on. Thanks to the all the folks that comprise the Hard Corps of the Big Apple. And thanks to all ya’all who have joined us for a foray into Frisbee Frolicking. There’s but one question left. When are YOU Comin’ Down??!!!! This entry was posted in A*T Chronicles - 2010, Guest Jammer Initiative Jams. Bookmark the permalink.